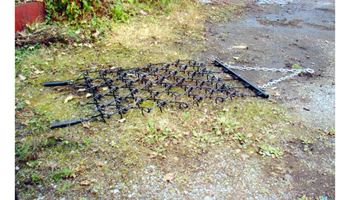 Grass harrows are an effective method of maintaining and renovating existing pastures and other large areas of grass. Harrowing is a proven method to scarify the soil around grass plants, pulling out weeds and moss and of aerating and breaking up surface crusting. The harrow action also stimulates new growth of grass and will break up and distribute manure deposits and mole hills. 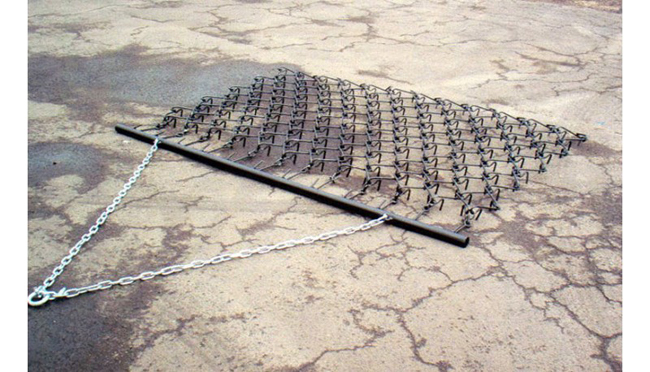 These harrows are made in the United Kingdom from the finest 12mm diameter high tensile steel. Each tine is 65mm long. The harrows are reversible and can be pulled as a smooth harrow for producing a fine tilth for seeding. In addition, they can be used to maintain surfaces such as sand, all weather tracks and maneges. Supplied with pole and coupler.